We all do it; we all wish we didn't do it; but we continue to do it anyway. Why is it that ending procrastination is so hard? Have you ever thought about how much different things would be if you could eliminate just this one habit from your life? I know I have. And believe me, I have tried. In fact I think it's safe to say, most folks work on this on a continual basis. I will get to it next week (next month, or after the holidays). 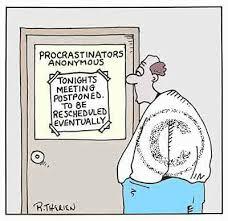 Here is a big reason for ending procrastination once and for all. I'ts costing you money! Finish Reading the Rest of the Post Here ….. Wasting time, or delaying getting back to people will kill a business. It will also make a business. I pick ed many customers, just because I called back. And I have also experienced the frustration of calling many contractors, and not getting a call back. Isn’t that just crazy? Who does marketing and then doesn’t call folks back? Sadly – both of us know that answer. I have also had problems with contractors. It’s like they don’t need the work. We will be standing when they are all gone; I am sure of that. Thanks for stopping by. Be sure to subscribe so you get all of the special notifications.